Let me start by saying that I am not criticizing anyone’s parenting style. I’m only talking about metaphors used to describe some parenting styles. The other day, a few of my neighbors were discussing the start of the new semester at a local university and the annoyance of traffic, noise, and parties. One neighbor confessed that she found it amusing to watch college students trying to figure out how shop for groceries. Another neighbor mentioned that the lack of life skills was the result of having lawnmower parents. I’m familiar with the term helicopter parent, but lawnmower parent is new to me. Most folks associate helicopter parent with a parent who hovers. 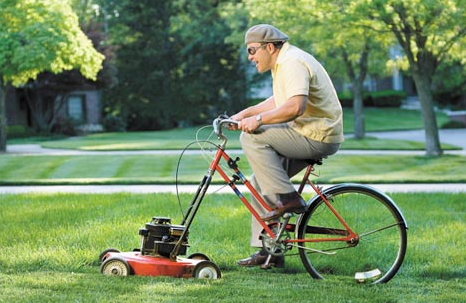 A lawnmower parent clears all obstacles from his or her child’s path, so the child never has to deal with any problems. I found an article that mentioned the term lawnmower parent as having a British origin and first being used in the book titled Selfish, Scared & Stupid (2014), written by Kieran Flanagan and Dan Gregory. I also found an article that mentioned the term helicopter parent firstbeing used in a book called Parenting with Love and Logic (1990), written by Jim Fay and Foster Cline.